My feelings apart, let me come to today's recipe. Eating fish or any non-veg recipes were like once in a while and sometimes we buy on consecutive weeks depends on my husband's liking. Before he buys anything he wanted, he used to tell how I would need to prepare it. This time he wanted fish fry in chettinad style. As per the recipe given by my MIL, I made these fries except which I added kalpasi which she never adds it. She adds more pepper, where I have reduced it a bit. 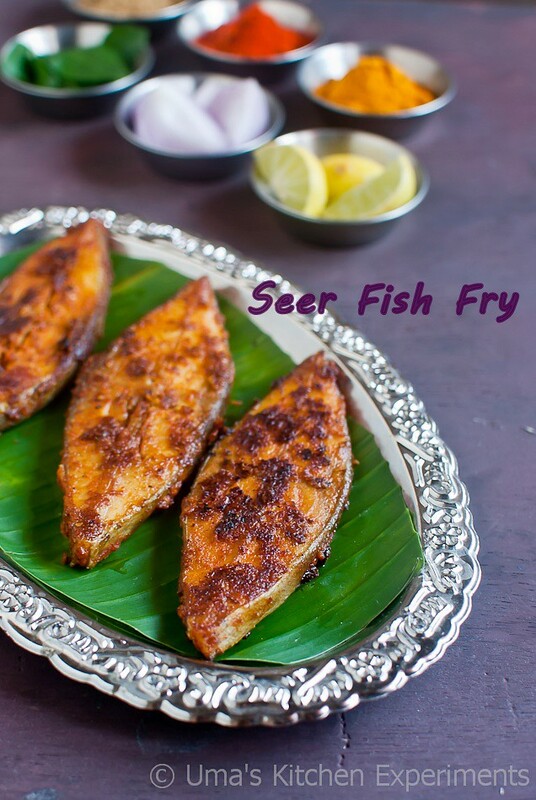 This way, any fish can be used to make fry but I used Seer fish(Vanjaram Meen) which is also called as Neimeen and King fish. 1) Wash the fish fillets in cold water. 2) Dry roast all the spices from red chilli powder to turmeric powder in thick bottom kadai in low flame. Once done, transfer to a plate and add a teapsoon of oil to the same kadai. Add small onion and saute till it becomes soft. Transfer it to a plate. Grind the roasted spices, sauteed onion, ginger and garlic together in a mixie with the help of little water. Grind till u get a smooth, thick consistency. 3) Add salt to it and mix well. The ground paste should be thick. Now, the chettinad masala is ready. 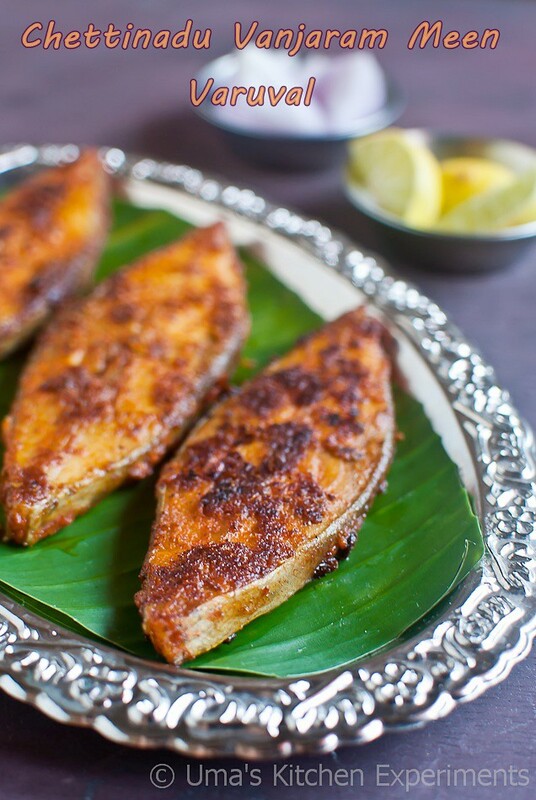 4) Apply this masala to the fish fillets and arrange them in a wide plate. 5) Keep covered using cling wrap and let it be untouched for 1 hour for marination. 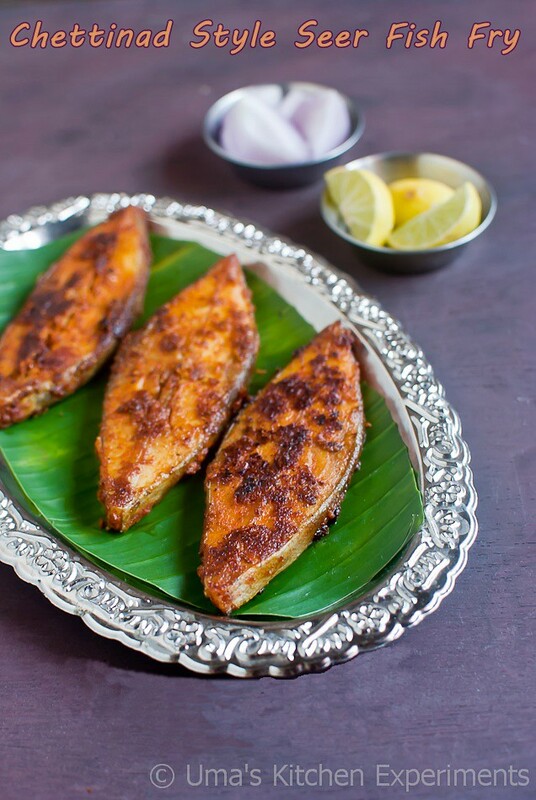 You can even keep this masala coated fish inside the refrigerator for overnight. If you keep the fish in fridge, bring it to room temperature before frying it. 6) Heat tawa. Place the fish fillets gently, drizzle enough oil to cook the fish. Turn to other side to cook other side after few minutes. Use oil generously for the tasty fish. Alternately you can deep fry these fish fillets. 7) Serve hot with slices onion and lemon wedges. 1) This masala can be stored in refrigerator for 2-3 days. Alternatively, you can roast the spices and store in a clean bottle for a month time and when u are about to prepare the fish fry, saute the onion and grind it with required quantity of masala and ginger garlic paste. 2) Kalpaasi is optional. As you know, I am little intolerant to the smell of fried fish and hence I added it. Fish lovers can simple avoid it. 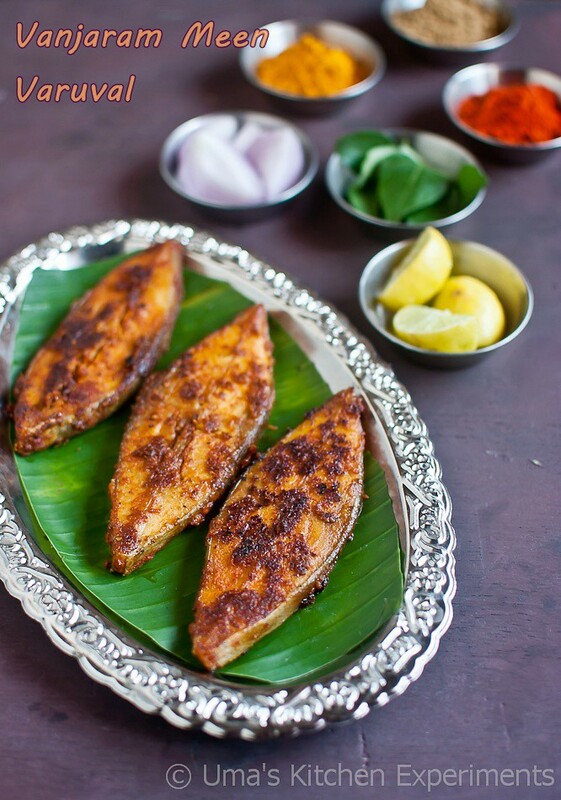 3) Choose thin slices for perfect marination of fish. Any types of fish fillets can be used. wow what a tempting pics!delicious..
Wow fish perfectly coated with Masala... awesome click.